Most gardens are, logically enough, horizontal, or perhaps terraced but still basically earthbound, being that they are, of course, gardens. But thanks to Petaluma's 15-year-old ordinance requiring developers to invest in public art when constructing new properties, there is a garden outside of the relatively new Friedman's Home Improvement (winner, once again, of Best Home Improvement Store) in Petaluma that is not earthbound at all. It's vertical. 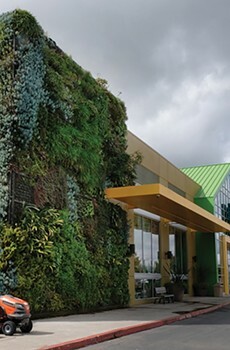 Literally clinging to the wall on the exterior of the building within the Deer Creek Village shopping center, the garden stretches from the ground to the roof, and features dozens of flowers and succulents and other green, gold and growing things. It's instantly magical to behold, and a bit befuddling. How do those plants do that, and how are they maintained, and is this even really a garden or an actual art installation employing a kind of botanical paint to color the canvas? That, actually, is part of the point of a good garden, isn't it? To exist in that special place that grows between art and agriculture, blurring both definitions by boldly and beautifully putting down roots in both worlds at once. 429 N. McDowell Blvd., Petaluma. 707.774.8400. friedmanshome.com.—D.T. Every spring I'd look at all the weeds and debris piles left over from the winter in my yard and decide: This is the year. I'm going to get my yard in shape, build a deck here and lay down a stone path there. But once the weeds were gone I'd lose focus, unsure how it was all going to work out. I'd trudge ahead until I was done, but I wasn't done because my plans never materialized as intended and my yard generally looked kind of half-assed. And then winter would come and then spring and I'd start over. What I learned is you really can't just go to Home Depot, buy some plants and mulch and a few solar path lights, and think you're going to have a coherently designed yard. At least I can't. I finally hired the good folks at Elder Creek Landscapes. They listened to my woes and decoded what I'd been trying to do, then greatly improved on it and drew it up into a beautiful plan that I could never have done myself. It will take a while until I can install it all, but at least now I have a plan. 130 Petaluma Ave. #3A, Sebastopol. 707.827.7913. eldercreek.com.—S.H. Far be it from me to complain too often or too loudly that I am paying thousands of dollars more each year for the very same dwelling that I originally rented what seems like a blink of an eye ago. Lots of North Bay renters are in the same boat, or worse, and besides, as my landlord is sure to inform me upon each rent hike, "It's below market." Nor am I the sort of churlish type to whom it would even occur to wonder, following the ballot box defeat of the city of Santa Rosa's tepid rent-control ordinance in 2017, just what percentage of no votes belonged to citizens who, then comfortably ensconced in luxurious accommodations beetling over the ridge above my squalid little hovel, found themselves scratching at the door of an extortionate rental market just a few months later. I can tell you I only feel pity for such a person. But it was sweet reprieve to learn that the saints over at City Hall extended an anti–rent gouging measure, which they passed in the wake of the 2017 hell fires, into October 2019 (the state's ban extends until May 31, 2019). That's when this year's rent hike met its match. Rents cannot exceed 10 percent over the rent prior to October 2017—not just this year's increase, but the total. So cheers to you, council folk. With my $50 savings, I'm serving Fancy Feast at my house. I mean for the cats, not myself. Well, at least until October.—J.K. Live a good life. Be kind. Be generous, if not materially then in spirit. Should you fail at this pretty simple thing to do and (a) murder a bunch of people, join the Proud Boys or accept a post to Trump's cabinet, and (b) if the Jains are right after all, then pray you don't reincarnate as a tiny, fluttering thing in this place: California Carnivores in Sebastopol. There's simply no safe place to land, if you're a gnat. I know: you're feeling exhausted and thirsty after so much winging about and, in a prior life, demonically striving to privatize public education, but don't rest on a butterwort; you'll dissolve. Don't dip your wee proboscis down the funnel of a pitcher plant; you'll end trapped in a bowl of digestive nectar. It's a true, if tiny, horror show—something the staff at Cali Carnivores mischievously play up, with botanical placards scripted in scary-movie font and a life-sized fiberglass Audrey, the carnivorous hottie from Little Shop of Horrors, sentried in the entryway. It's not all giggles and games, however; the folks at California Carnivores are passionate and devoted, and know their stuff. 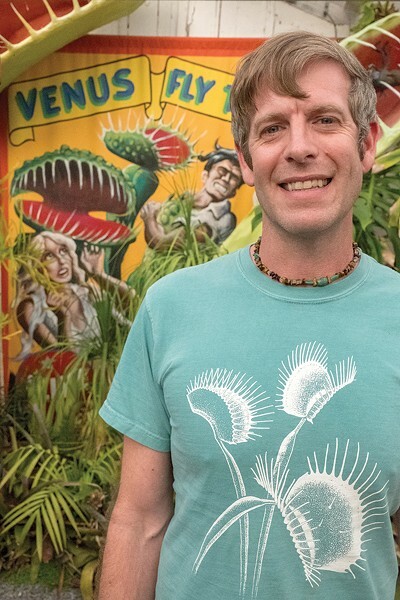 Founder Peter D'Amato wrote the bible on the subject, the sinisterly titled Savage Garden, now in its eighth printing, and owner-manager Damon Collingsworth (pictured) has assisted in the installation of carnivorous gardens for institutions around the country—he can help set one up for you! True, a visit to Cali Carnivores can set you back upwards of $80 for a large Sarracenia, but these sturdy guys can live decades. That works out to a pretty decent deal. And who knows, yours could be the famished pitcher plant that outlives Kirstjen Nielsen and makes short work of her mosquito-bound soul some sunny future day. The arc of justice is long—but it's hungry. 2833 Old Gravenstein Hwy., Sebastopol. 707.824.0433. californiacarnivores.com.—G.B. Theaters have been trying to keep people coming in the door for decades, despite the total saturation of pop-culture entertainment. Now that 3D has, for the most part, crashed and burned, theaters in Dan Tocchini's Santa Rosa Entertainment group have hit on a new plan: make the seating desirable in and of itself. The old fold-down chairs with little drink holders on the side are now a thing of the past. In their place: cozy armchairs (which you reserve when you buy your ticket—you can also reserve a seat online) that look as though they were lifted right out of a living room catalogue. Ever dropped your popcorn or had no place to put a drink because your neighbor has already monopolized the holder? Not an issue anymore. Every seat at Santa Rosa's Roxy and Airport stadiums and Petaluma's Boulevard Stadium now has its own holder and tray, allowing you to eat and drink while watching in comfort. To complete the feels-like-you're-relaxing-at-home experience, all chairs recline, complete with footrest. If there's a downside to this upgrade, it's that these new, cushier, reclining chairs could make you fall asleep before the movie's over—but that's really on the film to keep that from happening. santarosacinemas.com.—A.T.R. 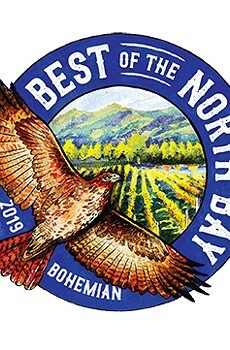 The sound of power tools in an adjacent room interrupts the pop of corks and the glug of wine being poured at a tasting for the first anniversary of Petaluma Gap American Viticultural Area (AVA), and that's OK. The folks at Hotel Petaluma have done such a fine job restoring this historic hostelry to former glory, it's fine by me if they finish whatever details they've got to do by day or night. This is my first visit to the hotel's Goldman Ballroom. The style was probably dated a few years after the hotel's original opening in 1924, but it's perfectly grand and puts me in the mind of an early 20th-century campaign rally—say, like in Citizen Kane, except on a very much smaller scale—and in fact has been used for election-night festivities. Who's that up there in the balcony, Jim Gettys clutching his top hat? No, it's a bottle of Petaluma Gap Pinot Noir, how delicious. 205 Kentucky St., Petaluma. 707.559.3393. hotelpetaluma.com.—J.K. Spend anytime in western Sonoma County, and you'll see yellow signs for the Occidental Arts & Ecology Center's fall plant sales. They are a West County staple. But you don't have to wait until fall. The nursery opens April 6. The drive up to OAEC and walking around the lush greenhouse is a treat in itself. But it's the flora, both exotic and domestic, that is the real attraction. 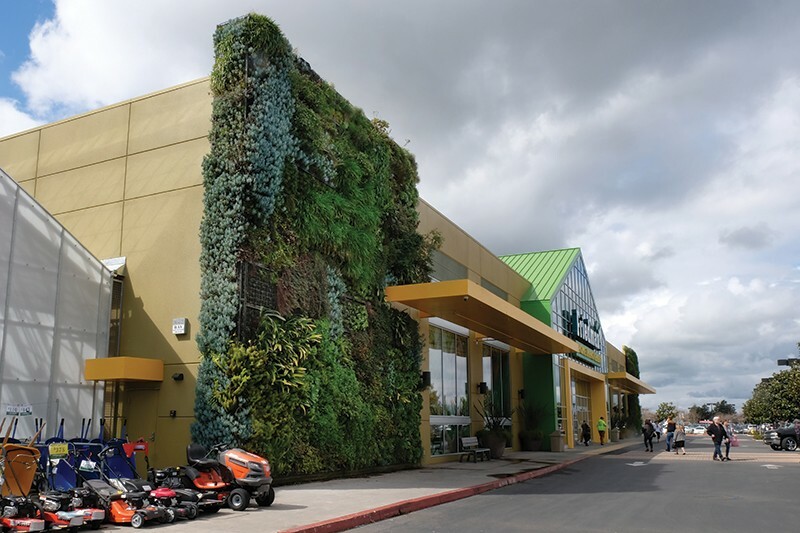 The OAEC got into the plant-sale game early, but now there are competitors everywhere. To distinguish itself, the OAEC has an impressive selection of heirloom tomatoes you've never heard of, as well as an array of Andean plants (try oca, a creamy, starchy potato-like plant that's an important food source in the Andes) and perennial vegetables that keep giving year after year like tree collards (my favorite), sea beets and perpetual spinach. 15290 Coleman Valley Road, Occidental. 707.874.1557. oaec.org.—S.H.